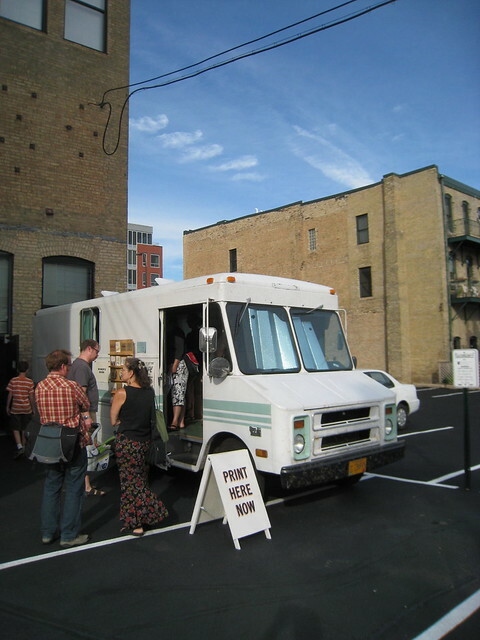 Starting out in Oregon, Kyle Durrie's Moveable Type, a box van loaded with letterpress gear that's been making stops around the country, rolled into Minneapolis last night. 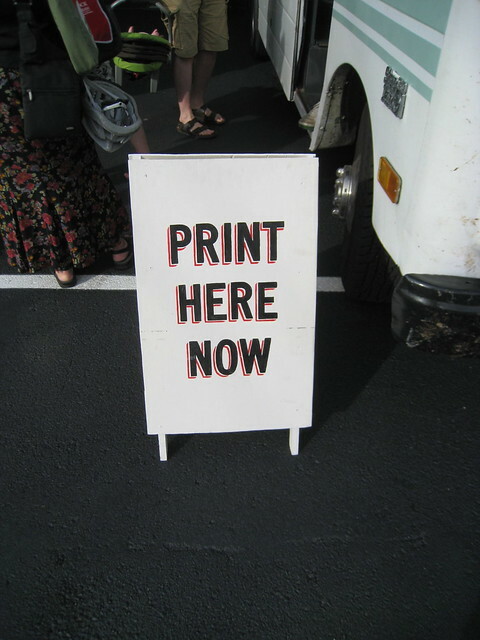 Parked by the Minnesota Center for Book Arts, the type truck opened its doors to visitors who wished to give the press a pull or talk to Durrie about the project, which she says she's been documenting for an upcoming exhibition. She's designed unique pieces at each stop, and here's what she came up with here. 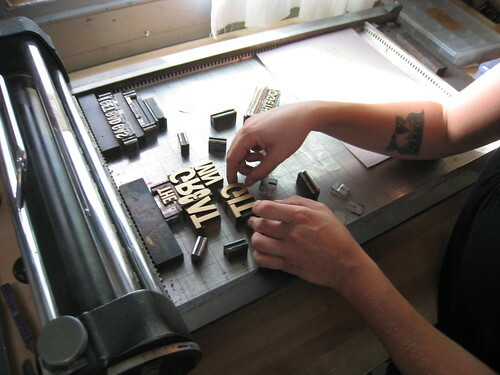 Moveable Type -- a 1982 Chevy van loaded with letterpress equipment -- makes a pit stop in Minneapolis tonight with a workshop and talk at the Minneapolis Center for Book Arts, followed by a potluck after-party in South Minneapolis at the Zine Apothecary, a resource center for zine makers near Powderhorn Park. Moveable Type founder Kyle Durrie, fresh off a stop in Iowa (which is neither Idaho nor Ohio) brings her mobile letterpress studio to MCBA (1011 Washington Ave S) from 4 to 7 as she gives visitors a chance to try out a press and hear about her itinerant printing practice (a slideshow's part of the deal). Then the festivities move to the Apothecary (3310 15th Ave S.), a zine library created by artist/photographer Lacey Prpić Hedtke, where zine makers and fans can share a dish and their work. "I'd been admiring the Moveable Type truck from afar and was sad it wasn't coming to Minneapolis," Hedtke explains via email. "I must have sent out an Aquarius brain wave, because MCBA asked if I'd want to do an afterparty at the Zine Apothecary if they could get the Type Truck to do an event at MCBA." 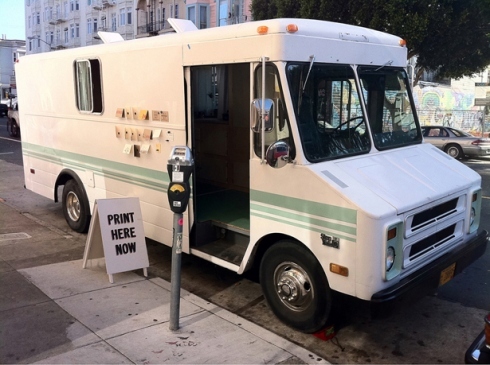 She says that following the MCBA event, the type truck along along with the Fly Away Zine Mobile will head to her place, where zine fans can peruse and check out zines (three-week limit). A sister project of the Zine Apothecary, the Fly Away Zine Mobile will be open as a reading loung, she adds, "complete with a stripy orange cat." Opened this May, the Zine Apothecary combines the zine libraries from the Belfry Center for Social and Cultural Activities and the Stevens Square Center for the Arts, offering some 2,000 zines on topics ranging from politics and health and wellness to food and photography. "I'm really excited about our large how-to section, and would like to build the collection so that's one of our main focuses," she notes. "We also have a 'Weird' section, and a 'Little of Everything' section." With the surge in food-truck culture of late, the project seems to fit into the zeitgeist. But Hedtke points out Minneapolis' unique culture as more of a factor. 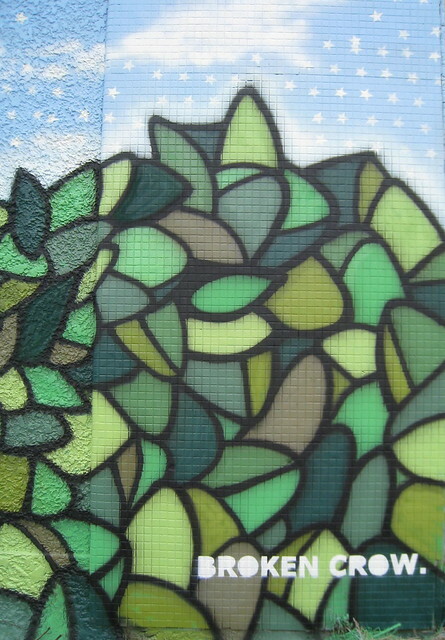 "It embodies a lot about what I love about Minneapolis -- it's sort of private, sort of public. It's sort of underground, but enough people know about it that it's not unapproachable. The Zine Apothecary is a little old fashioned in its content, a little new-fangled in its approach, and has something for almost everyone." Are there rules to graffiti? 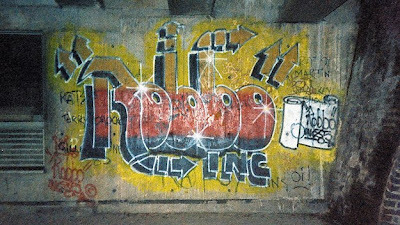 That question is at the crux of the fascinating new Channel 4 program Graffiti Wars, which chronicles a long-running feud between a legendary London graffiti artist and an artist whose fame and marketability are unsurpassed in the street-art genre. 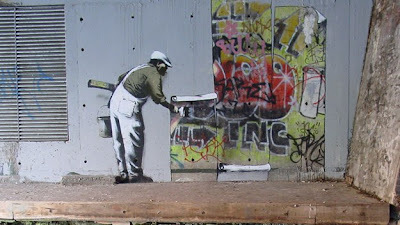 While the movie tells of an alleged physical altercation between Banksy and King Robbo years ago as one possible motive for the feud, the central question of Graffiti Wars is whether Banksy "broke the rules" of graffiti by altering the last remaining work by 1980s writer Robbo. He responded to Banksy's image of a worker painting over Robbo's piece on a canal wall in north-central London by replacing his old mural with the words KING ROBBO. To that, Banksy or his fans replied, adding a FUC before KING. 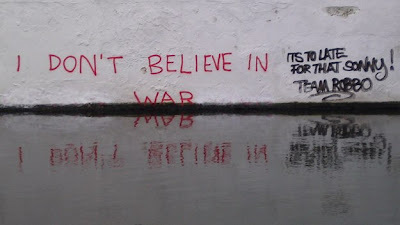 Banksy's infamous "I don't believe in global warming" piece was likewise modified by Robbo, who reportedly canoed to the site in a confiscated canoe (paddling with his hands) to alter the message to read: "I don't believe in global war," with the added note, "It's too late for that, Sonny." He signed it Team Robbo. The back-and-forth continued from late 2009 and into 2010, with some of Banksy's more famous works getting Robbo retouches. 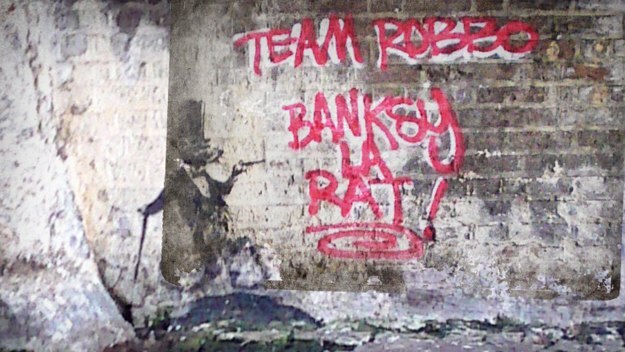 Eventually, as the film tells, things got uglier, with Banksy's fans threatening Robbo (someone added a "Die Robbo" tag to one piece) and Robbo altering one of Banky's trademark rat pieces to give homage to Blek le Rat, the Parisian graffiti artist who pioneered both street stenciling and rat imagery in the '80s: Banksy Le Rat. While Banksy once acknowledged his debt to Blek, the French artist doesn't seem to share the sentiment. "I'm not sure about his integrity," says Blek in Graffiti Wars about the appropriation of his style and imagery. Blek, whose website says he's the "original stencil pioneer," also doesn't get the same kind of props in the art world. The Deitch-curated Art in the Streets exhibition at LA MOCA dissed Blek altogether, as Carolina Miranda wrote in her ARTnews review of the show: "British prankster Banksy is given a sprawling space for an installation that includes a steamroller, stencils, and a taxidermied dog apparently relieving itself, while Blek Le Rat, a pioneer in the stencil form whose tongue-in-cheek images predate Banksy's work by at least a decade, is left out entirely." The program -- which includes interviews with Ben Eine, Robbo, Blek le Rat and others -- concludes with Robbo starting to see some Banksy-style success of his own. After criticizing Banksy's lucrative career and his lack of "street cred" Robbo winds up with a solo show at a gallery that helped launched Banksy's commercial career, and gets a commission to do a giant mural to promote a film at the Berlin Film Festival. Unlike Banksy, who didn't make an appearance at the Oscars when Exit Through the Gift Shop was nominated, Robbo attended the film's premiere, wearing a suit and a mask to hide his identity, to vamp for the cameras on the red carpet. 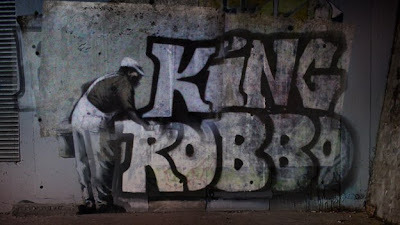 But that seems to have been the end of his rise, at least for now: A few days after filming for Graffiti War finished in April, Robbo was found unconscious with serious head injuries near his home and put into an induced coma. Robbo has been released from the intensive care unit, the London Standard wrote last week, "but his condition is not thought to be improving." As Team Robbo plans a fundraiser Sept. 4 to raise funds for Robbo and his 17-month old daughter, Banksy is being urged to donate a work for auction. He reportedly hasn't yet responded to that request. • Pete Brook, who runs the excellent site Prison Photography, is fundraising on Kickstarter to fund a road trip to do some 40 audio interviews cross-country with photographers addressing prisons and prison reform. Help fund this worthwhile project. • Little-known fact about Clara Kim, former REDCAT director and new senior visual arts curator at the Walker: She learned to drive stick shift from a member of Superflex. That, as well as news that she'll be curating a show of video projections by Minouk Lim next May, in Minnesota Monthly's interview. 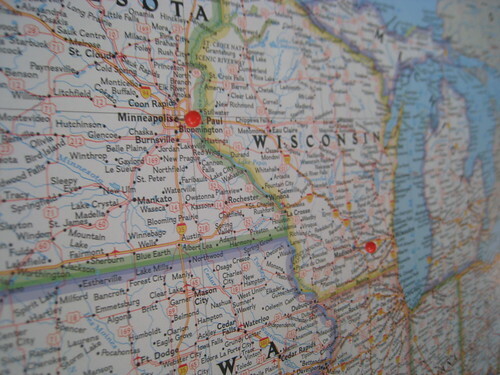 • The Rochester (Minn.) Art Center has reportedly been getting some unfriendly press over its unsuccessful request from the city for $23,000 in funds to help cover a shortfall in operational costs. Go to the local paper to vote on whether you think the center should receive taxpayer funding. • The new issue of the Journal of Aesthetics & Protest, on "Grassroots Modernism," is ready for advance orders. • Your moment of dogheadwall. 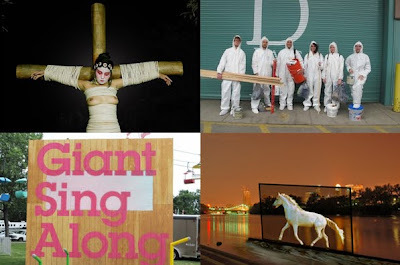 • The Soap Factory opens the exhibition Three Artists: Guo Gai, Meng Tang, Slinko Saturday night. Beijing-based Guo Gai's politically charged large-scale photos will be on view, and his chorale work "Lament" will be performed live by a local choir. Gai was detained by Chinese authorities for a month this April for his involvement with the pro-democracy movement; he is prohibited from traveling outside China and won't be attending the opening. Minneapolis-based Chinese artist Meng Tang will present her projection/installation piece Impression: Babel, and Ukrainian-born, New York-based sculptor Slinko will present the work-in-progress Make-Believe, which explores "the poetic possibilities of a physical object, its cultural role, the artistic labor invested in its materiality and its place in the contemporary circulation of immaterial commodities." Mark your calendar: I'm part of a panel discussion on "the interlocking issues of art, politics and censorship" on Sept. 17 with sculptor and exhibition co-curator Tom Rose, University of Minnesota China historian Edward Farmer and Rain Taxi editor Eric Lorberer. • The Future Presence Gallery, an occasional gallery at 1126 2nd St. NE, Minneapolis, presents Future Presence 3, a group show featuring works by Bryant Locher, Nathaniel, Austin Swearengin, Justin James Sehorn, Joshua Wilichowski, Hannah Hall, Russ Olson, Danielle Voight, Gregory J. Rose, Ben Lansky and Andy Shannon. Aug. 26–28. • Hopsack Painting Co. is redoing the Dressing Room. Named after Valspar Paint's most popular color, Hopsack is the brainchild of Broc Blegen, whose inflatable George W. Bush monument I featured awhile back. His team of artists will unveil their creative use of the bland color at the Dressing Room, the residence/gallery of former Art of This Gallery head David Petersen and Crystal Quinn. Recepti0n Saturday night. • Saturday afternoon sculptor Aaron Dysart embarks on the maiden voyage of the S.S. Soap Boat, a seaworthy vessel made from 550 pounds of soap -- a metaphorical probing into the question of what it means to clean up the Mississippi. Launch starts at 1 pm at Boom Island in Minneapolis. 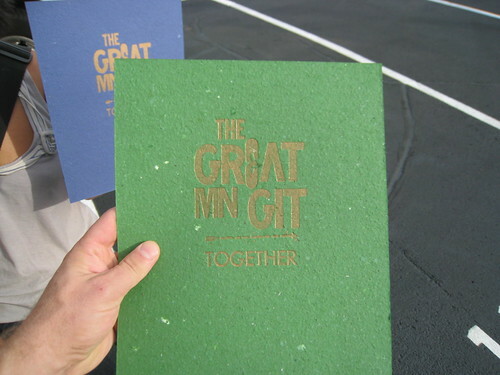 • And going on now at the Minnesota State Fair, the Giant Sing Along. Step up to one of 32 microphones to sing along with karaoke favorites presented on a giant LED screen. Shy singers, fret not: the mics are auto-tuned to disguise voices. 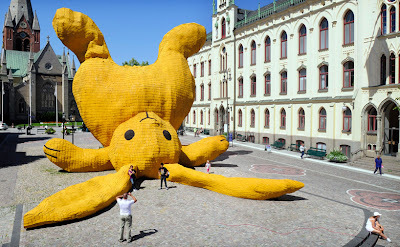 A project by Montreal-based artists Mouna Andraos and Melissa Mongiat, the project is put on by Northern Lights. Nightmare makes its much-anticipated debut launch from Harriet Island in St. Paul, MN, on Friday, August 26, 2011, at 9:00 pm. Nightmare will initially travel downriver past the Wabasha Bridge toward Lowertown Saint Paul after the launch, visible only from the Harriet Island side of the river till it turns around. Once Nightmare turns around, it will head upriver toward the High Bridge and Minneapolis, visible only from the downtown Saint Paul side of the Mississippi. It is anticipated Nightmare will be visible from downtown Saint Paul with views of the Mississippi between approximately 9:30 and 10 pm, passing by Upper Landing Park (across Shepard Rd from the Science Museum at Chestnut St.) at approximately 10 pm. Known for his photographs of Minneapolis' urban communities, Wing Young Huie has long lived and worked in some of the city's most diverse and bustling neighborhoods. His new one in south Minneapolis was recently the site of a stabbing: 22-year old Justin Jackson was killed Friday at an intersection near Wing's studio. Police won't be pressing charges as the stabbing was ruled self-defense and likely gang-related. On Facebook today, Wing reflects on the situation and welcomes visitors to the neighborhood for today's vigil to stop by his studio. While "art and engagement" is a buzzword in the institutional artworld these days -- and an admirable one at that -- I respect the many artists like Wing who embody it, by opening their studios or using their work to reflect and examine who we are and how we're connected. The tragic stabbing death last Friday in front of my Third Place Gallery on 38th & Chicago has been highly charged, provoking a multitude of reactions from paralyzing fear to connective support. It shocks and exposes our bubbled realities. 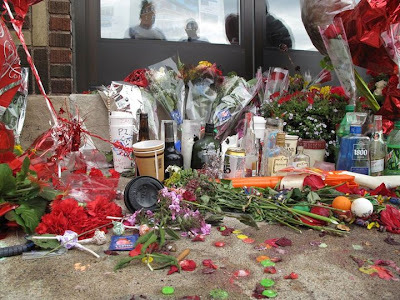 I've been interacting with many of the mourners keeping a vigil, inviting them into my gallery as the blood stained sidewalk became a growing shrine. To consider all the things that had to happen, the confluence of personal and historical dynamics, in this neighborhood, in this country, to bring this horrible incident to my front door, ostensibly over a pair of shoes, is dizzying and incomprehensible. How will this corner and beyond respond to this and its rippling currents? The wake is today, Wednesday August 24, 2011. Sometime after 3 pm a large contingent will converge here to pay their respects. A very, very large police force will be here also. I will be here too. All are welcome to come to The Third Place today and show their support. • Of Lei Yixin's monument to Martin Luther King, Jr., just unveiled in Washington, Hyperallegic writes: "It is the first monument to a non-US president on the National Mall and the first dedicated to a black American, except, well, it is memorialized in white … to fit in, we assume." • Meanwhile, in Indianapolis, members of the African-American community are protesting a planned sculpture of a freed slave by Fred Wilson, and in Charlottesville, a resident wants a 1919 sculpture of Sacajawea moved inside because it "obviously denigrates both women and Native Americans." 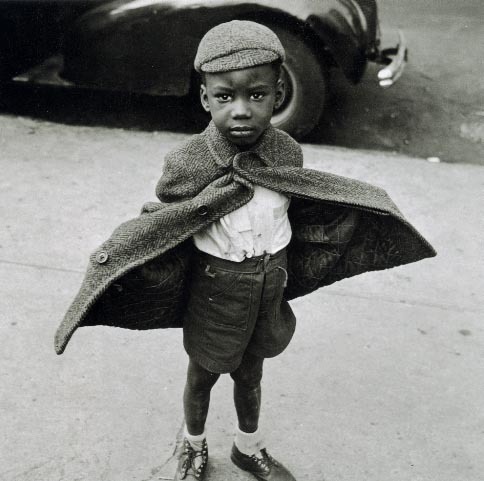 • RIP Jerome Liebling, photographer, filmmaker and founder of the University of Minnesota's film and photography program. Here's Mike Hazard's short film on the photographer. • Today Tyler Green's Tumblr blog 3rd of May -- which groups headlines with relevant works of art -- links Otto Dix's Shock Troops Advance Under Gas (1924) from his amazing series The War with news about fears of the safety of Syria's chemical weapons stockpile. • Warhol contemporary Ultra Violet proposes a Robert Indiana-esque 9/11 memorial. • Must-read from Pete Brook: How Google's mapping tools have spawned a new breed of art projects, for Wired. • $278.4 billion: How much "key cultural industries" contributed to the U.S. economy in 2009, according to the NEA. • Get your geek on: R2D2 sweater. 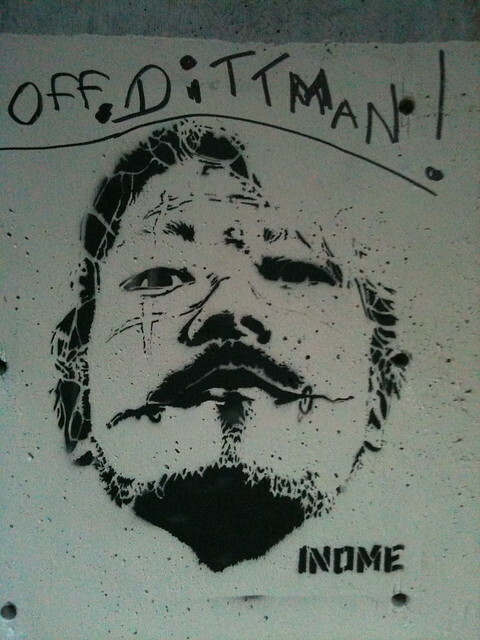 Filmmaker Takashi Miike's character Ichi, from the 2001 film Ichi the Killer, shows up in a stencil by Inome near the Minneapolis riverfront. The film, shown at the Walker as part of a 2003 retrospective, is based on the Hideo Yamamoto manga series of the same name. The artist Swoon's ties to Minneapolis run fairly deep: She helped launch the Miss Rockaway Armada from the Mississippi shores here (and did some wheatpaste pieces around town) in 2006; her work was part of the Minneapolis Institute of Arts' 2010 exhibition Until Now; and she did a residency last year with the Kulture Klub Collaborative, an art program with youth experiencing homelessness. 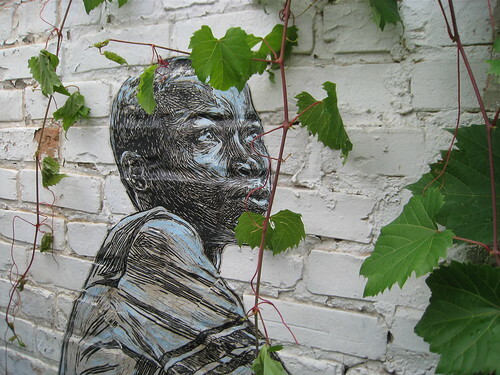 Near Minneapolis' Cedar-Riverside light rail station, I recently spotted one of her works on a wall, nearly covered by vines. But it's about another locale to which she has deep ties: Haiti. The work features an image Swoon also used on prints created to raise funds for the Konbit Shelter, "a sustainable building project with the objective of sharing knowledge and resources through the creation of homes and community spaces in post earthquake Haiti." (See the construction of the shelters on the project's blog.) The project's first community center was inaugurated this January. 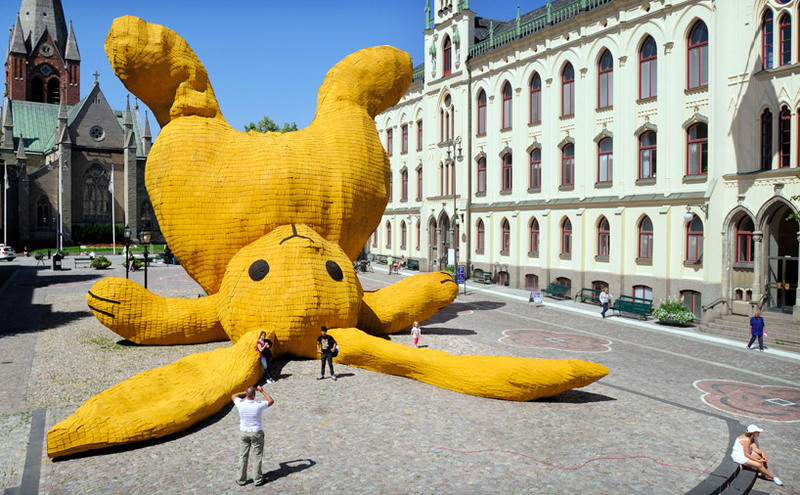 A version of the piece in Minneapolis appeared in a London show, and on London streets, and here it has an equally global context. 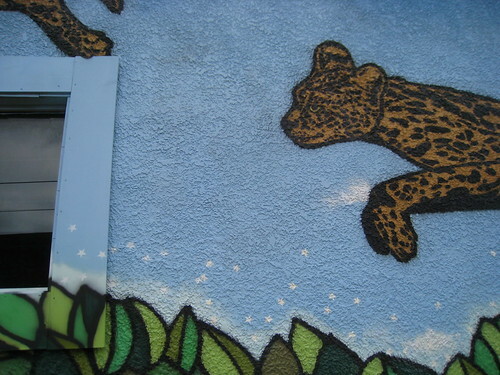 Situated in the heart of Minnesota's Somali community, it's now got company across the tracks in Broken Crow's new mural of running cheetahs. Broken Crow's travels took the duo -- Mike Fitzsimmons and John Grider -- to Gambia last year just as Swoon was returning to Haiti. Her journeys, likewise, have hit the African continent: Last spring, she taught artmaking in Zambia. 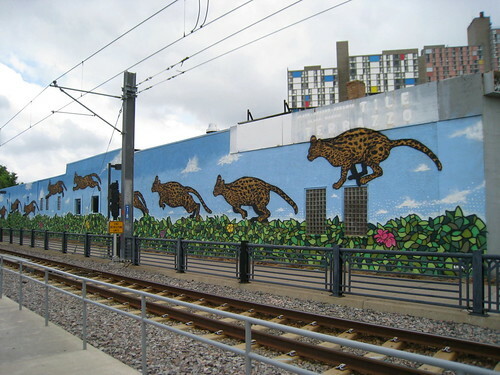 The ever-prolific Broken Crow (Mike Fitzsimmons and John Grider) recently finished another mural: A gigantic piece showing running cheetahs that's viewable from the light rail train as it passes north through Cedar-Riverside en route to downtown (update: John tells me they're not cheetahs, but servals). The piece stands in contrast to the towering minimalist architecture of Ralph Rapson, whose Riverside Plaza is both famous (it was featured as Mary Tyler Moore's apartment building on later seasons of the show) and infamous (some dubbed it the "Ghetto in the Sky" for problems there in the '80s and '90s). 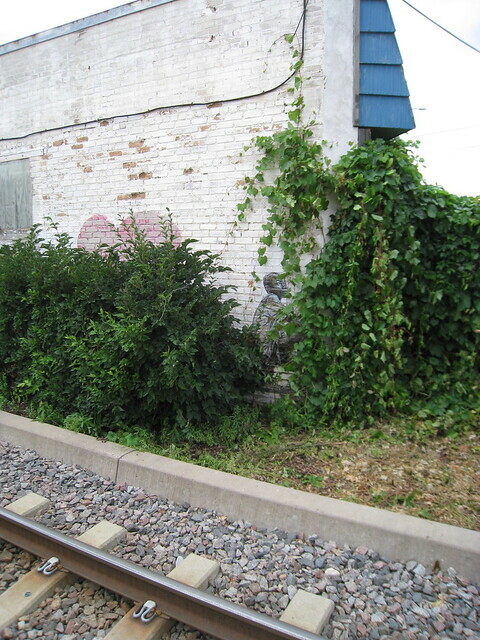 But the piece's site specificity refers mainly to the bike path and train tracks right beside it. 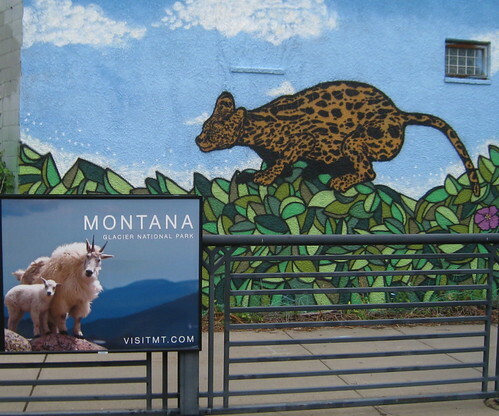 But a funny juxtaposition of mural and advertising (above) suggests one possibility of what they might be bounding after. See more photos at my Flickr page. Video: Etsuko Ichikawa's "glass pyrographs"
Jen Graves tips us off to this lyrical video of Etsuko Ichikawa creating her enigmatic works on paper -- using molten glass pressed briefly onto paper. In her artist's statement, Ichikawa says her "glass pyrographs" are "made by drawing hot molten glass, which is one way to capture and eternalize the immediacy of a moment, while my hanging and floating installations are about ever-changing states of mind."